The Camplex 8-Channel LC Single-Mode Fiber Tactical Snake comes in a reel of 250'. It is a ruggedized multi-channel fiber optic cable designed for multiple deployments for field production in outside broadcast, rental houses, and more. It is a highly flexible tight-buffered tactical cable with internal aramid strength members for crush resistance in high-traffic areas (if handled properly) and a polyurethane outer sheath designed to withstand crushing by both military tanks and outside broadcast vehicles. All assemblies are multi-stage machine polished and tested for <0.55 dB RL with test results for each channel supplied with each cable. 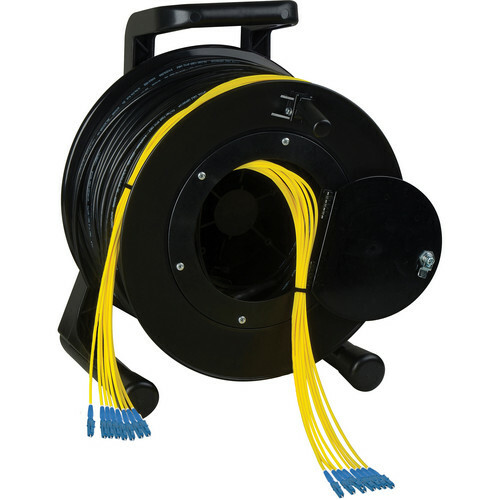 The Tactical Fiber Snake Reel includes Schill fiber optic cable reels with connector protection cavity and hinged latching door. The Schill reel has been carefully selected to ensure proper support and critical bend radius required by fiber optic cables. Note: It is recommended that tactical fiber optic cables over 25' be stored on a cable reel. Box Dimensions (LxWxH) 15.0 x 12.7 x 9.0"